The TAILORx trial, as it is known, is helping change everyday procedures in the everyday lives of patients around the world. And the lead author is our guest today. Dr. Joseph Sparano is Professor at Albert Einstein College of Medicine. He is Vice-Chair, ECOG-ACRIN Cancer Research Group and has been a BCRF Investigator since 2012. I asked Dr. Sparano about the TAILORx study and how it feels to have been part of such landmark work. But I also asked Dr. Sparano about what’s next – about new work he’s doing around breast cancer recurrence – specifically relapses that occur many years after original diagnosis. Chris Riback: Dr. Sparano, thanks for joining me, I appreciate your time. Dr. Joseph Sparano: My pleasure. Thank you for the invitation. Chris Riback: So you've had quite a last six months, to say the least. Any big news or studies that maybe you've been associated with that you'd like to discuss? Anything in the New York Times for example? Dr. Joseph Sparano: Sure. I guess my mention in the Times has been for good reasons and that surrounded the release of the results of the long awaited TAILORx Trial and this was really the first precision medicine trial and the largest precision medicine trial that's ever been coordinated and supported by the National Cancer Institute, probably will be the largest one ever conducted. Where we screened about 10,000 women who had estrogen receptor-positive, HER-2 negative lymph node-negative breast cancer which accounts for about half of all breast cancers in the US and about 9% of all cancers in the US. Dr. Joseph Sparano: A cancer where we typically recommend chemotherapy, adjuvant chemotherapy after potentially curative surgery to help reduce the risk of recurrence. But on average only about 3% to 5% of patients treated actually derived benefit. And our approach for the last probably 20 or so years has been to treat patients as a precaution in order to prevent the possibility of recurrence even though we really couldn't identify who was more or less likely to have benefit from therapy. So what we did was we took a new diagnostic test that became available around 2004, 2005 called the Oncotype DX 21-gene recurrent score. It's a test that could be done on routinely processed and collected tumor tissue that's typically stored in the pathology lab after it's removed and where it's sent to a lab and the RNA is extracted from the tumor in a panel of 21 genes evaluated. It's computed into what's called a recurrence score that provides prognostic information, it provides information that identifies who's at greater or lesser risk of occurrence if treated with endocrine therapy alone. But also more importantly, it identifies about 15% to 20% of patients who are the ones who are deriving the benefit from chemotherapy and it sort of takes the guesswork out of identifying and selecting the patients who are most likely to benefit. So what we did in TAILORx was we took patients who had, as I said, ER positive, HER-2 negative breast cancer who met standard clinical criteria for recommending or at least considering chemotherapy and then we assigned their chemotherapy treatment based on the score so that the score was low, very low. Dr. Joseph Sparano: We advised only endocrine therapy alone because we knew those patients had a very good prognosis for the endocrine therapy alone they were unlikely to benefit from chemo. And for the patients who score was very high we recommended chemotherapy and endocrine therapy for those patients because we know those patients had a 3% to 4% benefit, more like a 25% benefit from chemo. And for the remaining two thirds of patients who score was in the mid range, we randomize those patients by chance to receive chemo endocrine therapy which we consider the standard arm versus endocrine therapy alone. Dr. Joseph Sparano: And what we found is that the two-thirds of patients who fell into this group who had a mid range score, who had a risk of recurrence that was high enough to consider chemotherapy that we found that they actually were not benefiting from chemotherapy and that was a major finding that we reported at the 2018 ESCO meeting and published in the New England Journal of Medicine. So the bottom line is that it's turned this test which previously provided a clear direction to only about a third of patients who had a very high or very low score into a binary test. The test I can tell you, yes, you benefit from chemotherapy, you're in the 15%, maybe 20% who benefit from chemotherapy or know you're in the 80% to 85% of patients who definitely don't benefit from chemotherapy. Chris Riback: It's just remarkable. I mean, it's difficult to overstate, I would think, how massive of a change that is and kind of more specifically how big of a change that is not just, of course in the approach and the care for patients, of course, we can talk about that, but also the very practical and immediate effect that that has on people's lives on not other the folks who otherwise would have been undergoing chemotherapy. And now because of this, because I guess previously everyone, as you said, as a preventative measure, everyone was kind of assigned chemotherapy and now that's no longer the case and just to be part of something that's just such a massive change in immediate life enjoyment, life style, that's just got to feel remarkable. Dr. Joseph Sparano: It does, and it's a very gratifying experience. I'm particularly thankful to the 10,273 woman who volunteered for the study because none of this would have been possible without them. And I think many of them actually who participated who were in the mid range group, at least half of those women benefited because they would have otherwise received chemotherapy and they didn't. We found out now that they did just as well. So there are actually a large number of those patients directly benefited from participating the trial number one. Number two, they move the field forward and of now by virtue of the trial we now have a higher level of evidence to make treatment recommendations with a greater degree of precision than we've ever had. And thirdly, they've pushed the field even forward beyond the clinical scenario that the trial was designed for that is no negative disease because now people have a much higher comfort level with the using this test and maybe even other tests to spare the use of chemotherapy and women who were at higher risk of recurrence because of positive axillary lymph nodes. And in fact, at the recent San Antonio breast cancer symposium there was an entire session that was devoted to this, there was a counterpoint type of debate between two prominent breast medical oncologists about what they would do in patients with no positive disease on the basis of information regarding not only the clinical pathologic features but also the information provided by the recurrent score test to 21-gene. So it's moved the field I think forward and it's happening at a good time because we actually now have other treatments available that may help prevent recurrence that are not chemotherapy. Dr. Joseph Sparano: We've completed very large trials testing those agents, at least one very large trial called the Palace Trial, which is testing one of those agents called Power The Cycle of an early stage breast cancer and we have other new drugs that we're now able to move into this space and test determine whether or not they can help reduce the risk of recurrence in a way that chemotherapy has not been able to do. Chris Riback: Silly question. You said it was common practice commonly understood and I believe, please correct me if I'm wrong, it was around 2000 that the guidance came out for preventative measure to use chemotherapy. Do I have that date right? Around 2000? Dr. Joseph Sparano: Yes, there was an expert panel convened by the National Institute of Health that recommended that all women, regardless of lymph nodes status, hormonal status or age be considered for adjuvant chemotherapy. Chris Riback: So you've got an NIH sponsored group and that comes out with that type of finding, very very strong finding. What made you or others and the folks that you work with think, wait a second, maybe we ought to do a study and not just to study but you know, the biggest of all time and really look at that and question whether that recommendation is what we actually should be recommending? What was your hypothesis? What kind of drove you towards this? Dr. Joseph Sparano: Well, first of all, we knew at the time that probably 60% or more of patients who fell into this category were receiving adjuvant chemotherapy. Why wasn't a larger proportion of patients receiving? Well, probably because women who were older than 70 or who had significant medical problems or patients who just declining therapy because of the uncertainty of its potential benefit. So even with those patients who were not receiving therapy for whatever reason there was still a very large portion of patients who fell in this group of receiving chemotherapy, possibly up to 80,000 women a year. So that was point number one. Point number two was we never really had the tools to be able to evaluate gene expression profiling or other types of molecular profiling and breast cancer and those tools allowed us to develop assays that could do that. And then thirdly, we actually had the results of studies that showed that this assay, this test was not only prognostic but it was predictive of benefit from chemotherapy if the score was above a certain level. And we haven't information based not on the results of prospective clinical trials that were designed to test that, because those trials take years to do. What we had was we had tumor tissue stored from trials that had been completed years ago where we have long term follow up in which patients are randomized to chemotherapy or not and we were able to go back and study those samples and prospectively apply this new test. And when we did that, we were able to determine in a relatively short period of time that the test provided not only prognostic information but also predictive information for chemotherapy benefit. But then we were stuck with the fact that yes, the test provided useful information for maybe up to 30 patients who had a very high or very low score. But we really weren't sure about the majority of patients who had a score that was in the mid range. That was a key. And I guess the other important point is, when these tests are developed they're sort of developed in a way that we study the entire study population, the entire cohort of patients who were on that clinical trial, but that's not how clinicians use the test in practice. So they will selectively use the test. So for example, for patient who has a larger tumor maybe more than a three centimeter tumor and someone who's younger maybe under the age of 50 was a high grade despite being estrogen and progesterone receptor positive that clinician may not order that test. Or if someone is older and has a tumor that's less than a centimeter low grade, that clinician may not order the test. They make a clinical decision without that. The test is ordered mainly in situations where the clinician is uncertain where they have a woman who is in maybe the early 50s, who has a tumor between one and two centimeters and intermediate grade. And this was the most common scenario, this was the most common clinical scenario in TAILORx and is one of the most common clinical scenarios in clinical practice. And this is the population of patients from whom we have a very clear and convincing answer that the trial addressed. Chris Riback: Did you work in translational medicine you're talking about a little bit I guess in terms of the actual tests that are being ordered for patients. But that aspect of connecting research and actual medical practice with patients. First of all, I just want to confirm that I have that right that you do both and then if so what role did that play and if you don't practice translational medicine, what role did feedback from the field, from patients play in how you approached the research? Dr. Joseph Sparano: Yes translational medicine is defined as translating information, techniques, technology from the laboratory to the clinic and certainly the development of the 21-gene recurrence score leveraged technological advances that allowed one to extract RNA from routinely processed formal and fixed paraffin embedded tumor tissue. So that was really a huge technological advancement. The other advancement was the discovery based research that identified the genes that were associated with recurrence through what's called supervised analyses. Meaning that the researchers tested the association of specific patterns of gene expression with a recurrence versus no recurrence and looked at the differences in gene expression between the two and then developed an algorithm that integrated the information from these multiple genes. So yes, that's an example of the translational research. In terms of the input of patients and advocates that was very important. In the design of the trial there were patient advocates involved in the ECOG-ACRIN research group and other groups. One in particular Mary Lou Smith lead an effort to solicit feedback from patient advocates regarding the trial, it's design, the question it was addressing. The methods by which it was trying to address it. And in addition she organized and solicited feedback from patients, ordinary patients who are not professional advocates. And that feedback was really very important in not only helping to design the trial and affirming what our design was, but it also helps in terms of developing patient education materials that can help explain to patients why we were doing the trial and why it was important to them to volunteer for it. Chris Riback: Yeah, the feedback and the communication back and forth between research and actual work with actual patients that occurs in a clinic is always interesting to me and I can't tell you the number of researchers that I've spoken with who just highlight that component as important in terms of their understanding what they learn along the way, seeing it and getting that immediate human patient level feedback. It never ceases to amaze are impressed me how important that is. I want to ask you about another objective to the study which was to create a bio repository of tissue and blood, and you've mentioned this a bit, so that researchers can learn more about the patients in the low risk groups who had a recurrence and in the high risk groups who recurred despite added chemotherapy. And in fact, you've ended up with quite a repository, haven't you? Dr. Joseph Sparano: Yes, we have and actually this is where the funding from the BCRF was critical in terms of providing additional resources that needed to establish this bio repository. And it's been money well spent because of the fact that we have a really long term follow up on a very large number of patients who are uniformly treated and we have plans to do more advanced molecular sequencing on selected tumor specimens from patients, including patients who relapsed and those who didn't relapse so that we can get to another level of information that may not be provided by the recurrence score that may provide further insights with regard to prognosis, prediction and also identifying potential therapeutic targets. In other words, identifying non chemotherapy approaches that might help reduce the risk of recurrence or even treat patients with more advanced disease. So that that work is currently in process. Chris Riback: Question about you. How did you kind of get started in all of this in the first place? I mean, going way back and growing up, was it always science and math for you? Did you think about ever becoming a playwright or poet or anything like that, or were you always math and science? Dr. Joseph Sparano: I was pretty much math and science with sort of a touch of humanity and in terms of the fact that I was influenced very early on by a family member, my maternal grandmother who lived with us in a typical first second generation Italian-American home who developed breast cancer when I was very young and died of the disease. My recollection of the events although I was very young is that she had neglected breast cancer and presented with a very locally advanced stage of disease. And I do have the vivid memories of the priests coming into our home and giving last rites in a couple of occasions and her dealing with her illness. So that sort of sparked my interest in medicine and in general and in breast cancer in particular. And what also interested me in oncology was a second aspect of it was kind of the mystery behind it. That at the time that I got into the field or certainly when I was growing up and learning about science and medicine, a lot of it was very very mysterious. We had very little insight into what caused cancer, what drove cancer or even how to treat cancer. So that was the second critical point that that drew me to this field. And the third critical point was that for many types of human illnesses you can treat it, you can manage it, but you can't necessarily cure it, such as hypertension or diabetes or heart disease. But cancer is actually a disease that in many forms of cancer you can cure with either a combination of local therapy like surgery, radiation, and sometimes with systemic therapies added or entirely with systemic therapy with certain blood disorders, blood cancers, for example. So those are the three things that kind of drew me to it. The stakes associated with a diagnosis and the human toll it can take the mystery that surrounded a lot of it and the challenge in sort of uncovering those mysteries and deciphering how to better treat cancer and then the opportunity to actually cure people of an illness that's potentially life threatening. Chris Riback: How old were you when you were experiencing that with your grandmother? Dr. Joseph Sparano: I was about the age of five but it left a very big impression on me, let's say. But I also was sort of gravitated and inclined and interested in science. Again, what intrigued me about science was the mystery of a lot of science back then, especially the life sciences. Chris Riback: That's a remarkable mix of the personal but also I guess it just sounds like part of your DNA where you were just talking about the curiosity, about the life sciences and the mystery, very interesting and always interesting how different aspects of one's own personality and external events frequently can come together to set a live course. So the last item that I kind of have for you and what I think most of us, many of us, maybe all of us could really learn from you is time management. So I did a quick review of your work and you're involved and have been involved in so many different types of major research and major efforts. I mean biomarkers of recurrence in early stage breast cancer, improving treatment outcomes in breast cancer, developing invalidating gene expression signatures in breast cancer, evaluating interaction between breast cancer and the micro environment. There are others including developing more effective therapies for HIV associated cancers. So first, how do you find all the time, and secondly, do these all connect in some way that is easily understood by the rest of us? Dr. Joseph Sparano: Well, I guess the point of connection is the fact that at the end of the day or the beginning of the day, or between the beginning of the end of the day, for the most part I'm a clinician who tweets patients and most of the work that I do or really all of the work that I do I'm motivated and become interested involved with because it directly impacts the care of the patients that I care for. And so that really sort of guides me or directs me to become interested in certain areas. The second important point is that I certainly don't do this work alone, I surround myself with and interact with many, many, many talented people and I try and learn as much as I can from them and also look for opportunities to apply what I think is the best work to the care of my patients. And then thirdly, some of the eclectic nature of the work that I'm involved with such as the HIV associated cancers dates back to things that I was interested in because I commonly saw them in practice in the 1990s in the institution that I practice in and in the area of New York City that I practice in, HIV associated cancers were very common and rapidly lethal. And the prognosis associated with them has improved very much in part because of improved therapies directed against HIV but also improved anti cancer therapies. So that's sort of I think may explain some of the eclectic nature of some of the stuff that I've been involved with. Chris Riback: And Dr. Sparano there's work that you are currently doing funded by BCRF, tell me about that. Dr. Joseph Sparano: Yeah this is really important work that I'm really excited about. 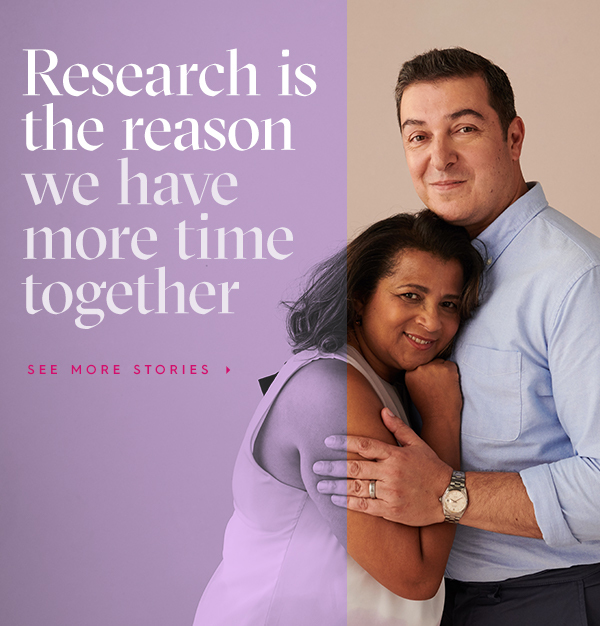 It actually started about five years ago when it became more and more recognized that half of all recurrences have estrogen receptor positive HER-2 negative breast cancer, the most common breast cancer subtype occurs not within the first five years of diagnosis but after five years. And this is a major problem and I became more aware of it as I became a more experienced clinician and had patients in my practice for long periods of time. And seeing women have a recurrence of their disease, 5, 10, 15, 20 and even 30 years after their diagnosis. And we really had no clue as to why these women were relapsing this late and what we can do to prevent these relapses. So I saw an opportunity to study this by evaluating women and offering women the opportunity to donate blood specimens who a woman who had already participated in other clinical trials were different treatments were tested and asked them would they participate another clinical trial because we were following them anyway, we knew what treatment they had, we already had their tumor specimens and their blood specimens at the time of their diagnosis and we asked them to provide additional blood specimens. And we created what we call the lake relapse bio specimen bank. So right now we have over, it may be close to 20,000 blood specimens in that bank so that we can study and apply some of the newest technologies like the ability to detect to our DNA in the blood. The ability to detect circulating tumor cells in the blood so we can evaluate tumor associated factors associated with recurrence and also host associated factors because we do know that there are factors in the patient that may be assisting and driving the risk of recurrence. So one of the first results that we had from that effort was a study where we looked for the presence of circulating tumor cells in women who were between four and a half and seven and a half years after diagnosis, clinically cancer free no evidence of recurrence by history and physical. And we found that about 5% of those women who had estrogen receptor positive, HER-2 negative disease actually had tumor cells circulating in their blood and we found that those women who had detectable, what we call seats and fees had about a 13 fold higher risk of occurrence. And that for the 5% of those who are CTC positive they had about a 30% risk of having a recurrence by two years whereas they were CTC negative they had a 97% chance of being cancer free at two years. So what we're doing now is we're in the process of designing a very large trial, a TAILORx like trial really where we will evaluate women who are five or more years after diagnosis, perform a CTC type test on them and then to select those women and then test a newer treatment like a CDK 4/6 inhibitor to see if we can prevent a recurrence from ever happening. The timing is actually right for this because the FDA has recently now recognized what's called metastasis free survival as an end point that can support the approval of drugs for the syndication. And the FDA just approved two drugs in men with prostate cancer in a very similar situation. Men who had local treatment for prostate cancer, local treatment meaning either surgery and or radiation who have a rising PSA but who have no evidence of cancer recurrence by standard imaging, CAT scans or bone scans. There have been two randomized trial showing that men who were treated with anti angiogenic therapy that can prevent the development of recurrence. So we think we can apply the same model in breast cancer and the NCI will be hosting a meeting in the Spring of 2019 to discuss and plan a trial that will have this as the foundation, that will have this as a framework for trying to prevent late recurrence. So I think this is the next frontier of trying to prevent recurrence of breast cancer. And the future that I see is that we'll be able to use these more sophisticated markers to detect what's called minimal residual disease, MRD, and identify who's really at risk of recurrence and then tailor treatments to prevent that risk. Because right now there's really no surveillance that's recommended in this setting. Conventional blood tests or tumor markers are not recommended scans, they're not recommended and we need better ways to monitor people who are at the highest risk of recurrence and intervene before that recurrence actually occurs. Chris Riback: And I assume this will help identify which patients are most likely to benefit then from specific therapies, is that right? Dr. Joseph Sparano: That's the hope. For example, there are tests for circulating tumor DNA that can detect mutations and what's called the ESR-1 or the estrogen receptor gene and those mutations identify tumors that are more sensitive to specific drugs. So yes, some of the technology that's evolving will allow us to identify not only who's at high risk but what drugs they may be more or less likely to respond to. Chris Riback: Dr. Sparano, thank you. Thank you for the conversation and thank you for work that you do. Dr. Joseph Sparano: Thank you. It's been my pleasure speaking with you. Chris Riback: That was my conversation with Dr. Joseph Sparano. My thanks to Dr. Sparano for joining and you for listening. To learn more about breast cancer research or to subscribe to our podcast, go to bcrf.org/podcasts.